Since New Year’s is a time of retrospect, I thought it might be a good time to look across time at an object that profoundly changed my outlook on the world and life. It is common knowledge today that when we are looking at the stars, we are looking into the past. They are so far away, it takes many years for their light to reach us so we are seeing them as they were ages ago. That is a fairly deep concept for me, but it never really hit home until one night about twenty-five years ago I discovered the Andromeda Galaxy in my binoculars. My interest in astronomy was sparked when Halley’s Comet last visited. I was living in the north edge of Austin, Texas and the skies were still very dark at night --- no big shopping malls, parking lots or buildings were in the immediate vicinity. I had purchased a cheap telescope, but I cannot say for sure that I ever really found Halley’s Comet. My wife, who is smarter than I am, journeyed to a local camera shop and told the sales person she had a husband interested in astronomy and was frustrated with his cheap $69 dollar , 300X Jasco Telescope. He handed her a $30 or $40 pair of 10 x 50 binoculars. You see, for viewing the heavens, it is not the magnification but the light amplification ability of the instrument that is most important.. The 10 x 50 binoculars were much more efficient than my cheap telescope. In plain talk, I could see dim objects. One night I was scanning the sky and I discovered a large fuzzy oval. Holy crap, I thought I had really discovered something. I ran into the house, checked a computer program that told me where and what was in the sky that night. Low and behold, I was the discoverer of the Andromeda Galaxy. Sadly, I quickly learned that others had already found it, cataloged it and named it. In fact, there are written records of it from the 10th century AD. Greeks Romans, Egyptians, etc., all must have been aware of it. The reason is that, if you are under a really dark sky, like northern Minnesota or western Texas, the Andromeda Galaxy is viewable with the naked eye. Nothing is required, not even a t-shirt --- that’s if you are way out in the boonies. Here is the life changing part. 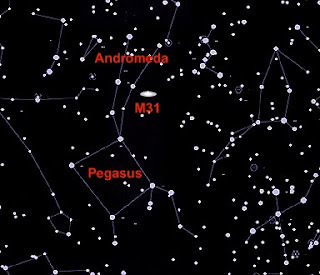 M-31, as people in astronomy circles refer to it, is an object in the sky the same size as a full moon. That is correct, it is the same size as a full moon. Generally, we do not notice it because it is faint. It is faint because it is 2.5 million light years away from us. To put it into perspective, most the bright stars in the sky we see are only a few thousand light years away. If people in the Andromeda Galaxy could view earth, they would see dinosaurs walking around. For an object to be the size of the full moon in our sky and to be 2.5 million light years away, it would have to be pretty big, right? Andromeda is about 170,000 light years across. That is about 3 or 4 times larger than our own Milky Way Galaxy. 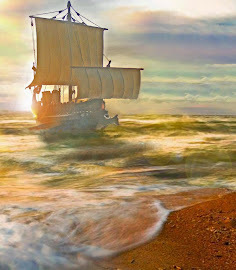 The idea that I could see something so distant and so vast, struck me deeply, perhaps even spiritually. When the nights get a little warmer, find a dark sky, grab your binoculars, and find Andromeda. Look for the big square that comprises the body of Pegasus. It is bright and easy to find. It rises early in the East in the Spring. Andromeda is just above it. Of course, it will not be a breath taking image, like the ones you see taken with the Hubble Telescope, it will just be an unremarkable faint, fuzzy oval, 2.5 million light years away, about the size of a full moon. Yes, it is looking into the past, but the most interesting idea is that it will eventually come and swallow our little galaxy cluster. The Milky Way and the Lesser and Greater Megallanic Clouds. Collided galaxies always make me wonder what life is like in them as this process starts. Sure most parts are destroyed, but the outer edges and tails could sustain. Interesting.